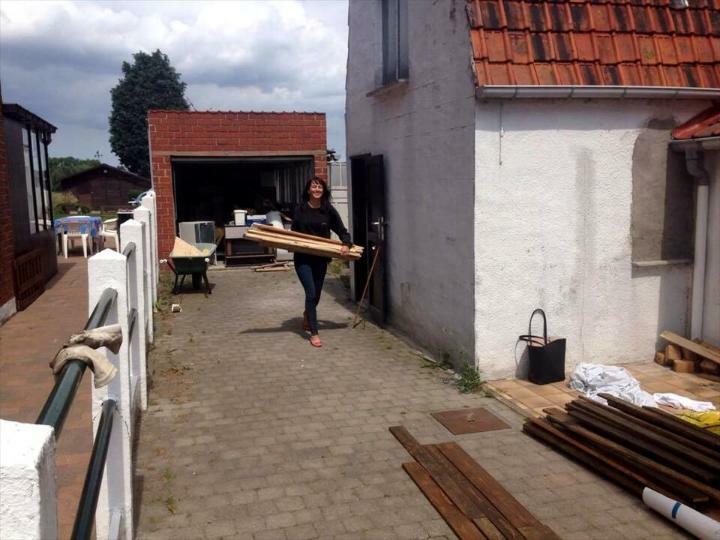 Recycling of pallets has been flourished so that you can get a whole home well to operate with them! 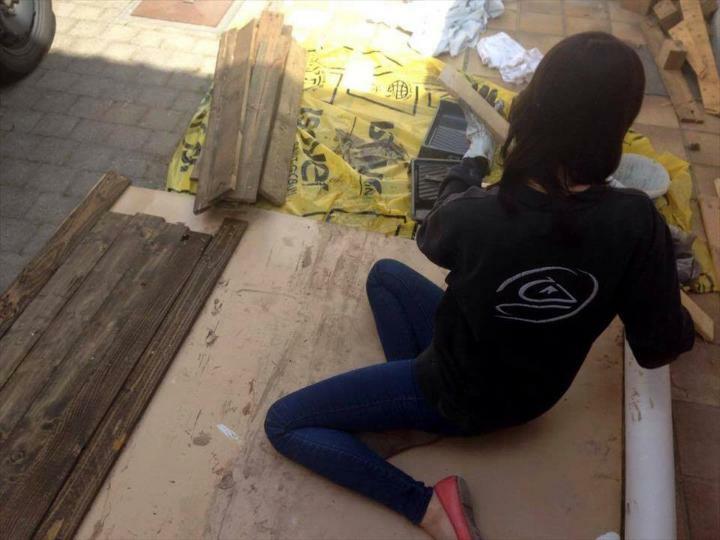 You are not at the place where bigger mysteries of creative pallet furniture are revealed on daily basis! 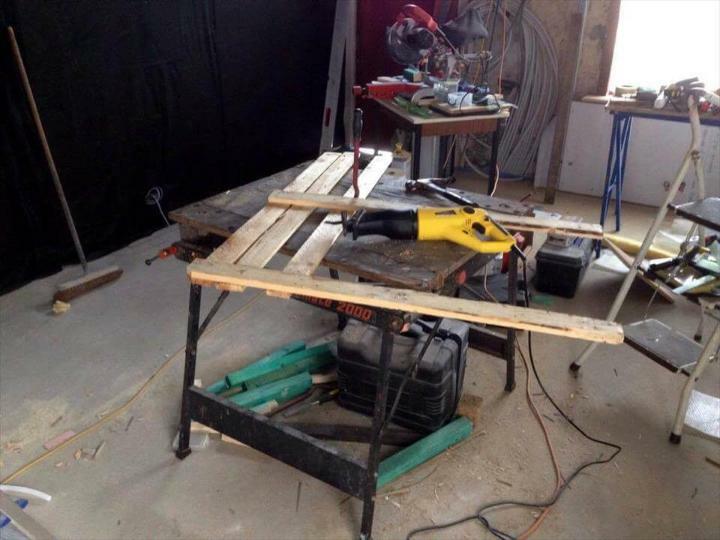 Now we are back here to make you notice that how you can do bizarre crafting works with pallets which can raise the aesthetic value of your home by great margin! 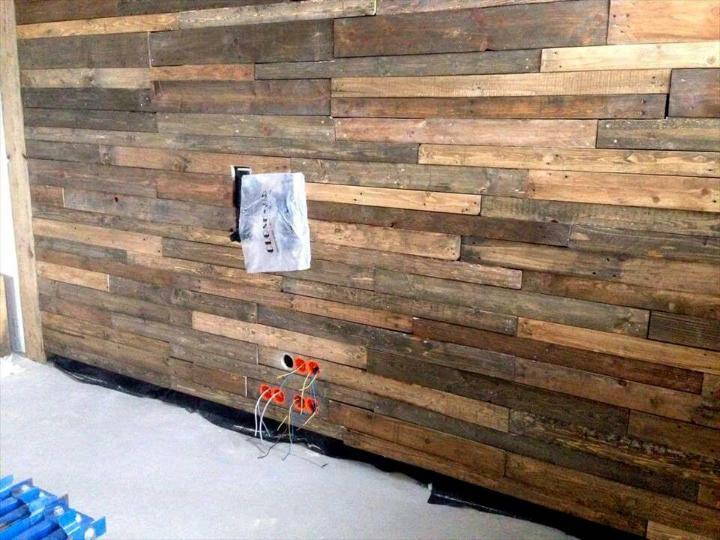 Lets peek into this DIY pallet wall construction project, a whole wall paneling has been done using those simple straight pallet planks separated from those rustic shipping boards using power reciprocating saw, this electric tool is really a super fast solution for pallet wood dismantling! Entire project is highly cost-efficient and is even friendly to ladies who want some amazing functional changes to their dwelling! 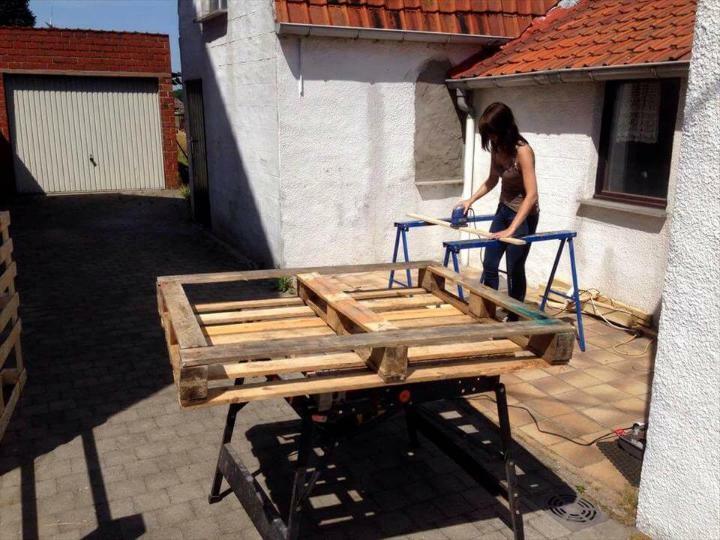 This pallet project has also been done by a brave lady and her efforts are really to appreciate here and electrical tools are really helping here a lot here! 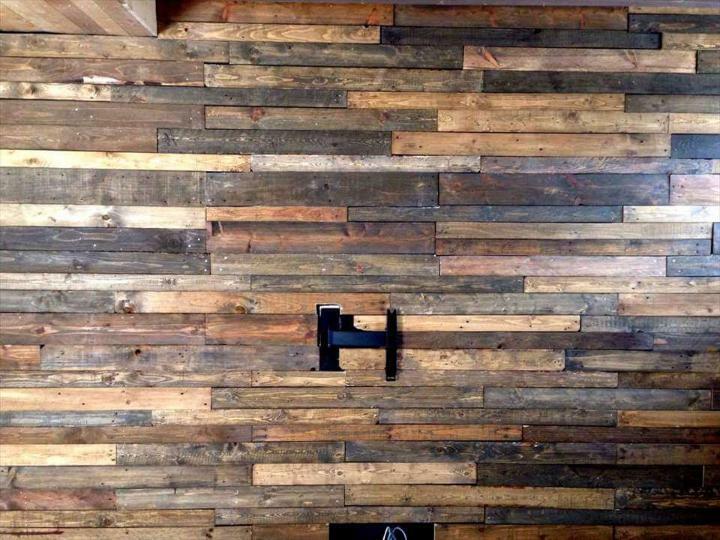 Entire visual presentation has been given here, so you can follow the instruction given in this DIY pallet wall tutorial to help yourself for better installation of this rustic wooden accent wall! 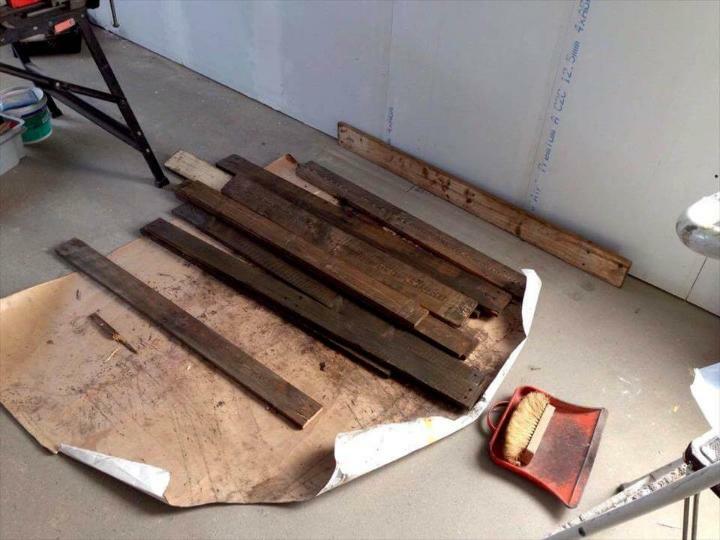 First of all quick dismantling has been done of well-washed and cleaned pallet boards, Sawzall electrical blades just really makes it super fast to tear the pallets into pieces so has been used here! 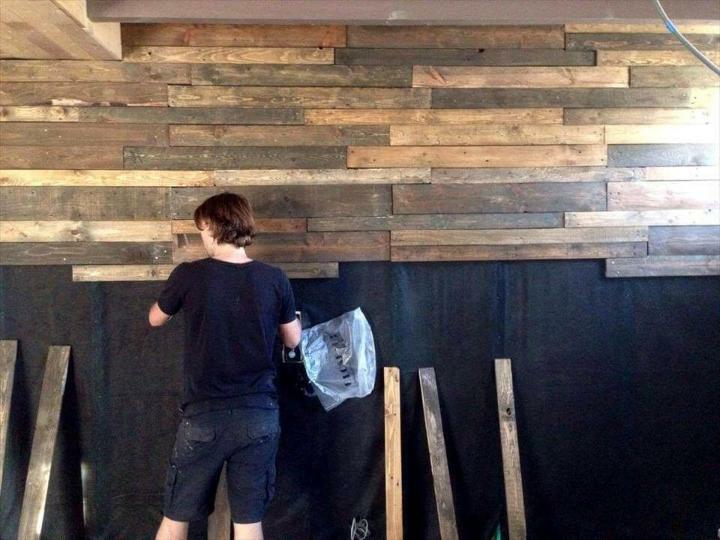 You need to carry with lot of pallet slats while intending to do those interior pallet wall paneling projects with pallets, so deconstruct a big stock of pallets to gain a big deal of straight wooden lengths! There are two A-frame slim top tables hired to sand the planks one by one, just put flat the over both supports and palm the electrical sander in hand to grit the wooden surfaces for overwhelming wooden glow, after sanding you will also not see any splinter popped up there! Now the staining time, carry the removed, cleaned and well sanded planks and apply the darker coats of stain or wood oil to them, using varnish coats will also be rocking! Cover the floors with old newspapers, old cloths or leftover rough sheets so stain spills will not spoil the floors! 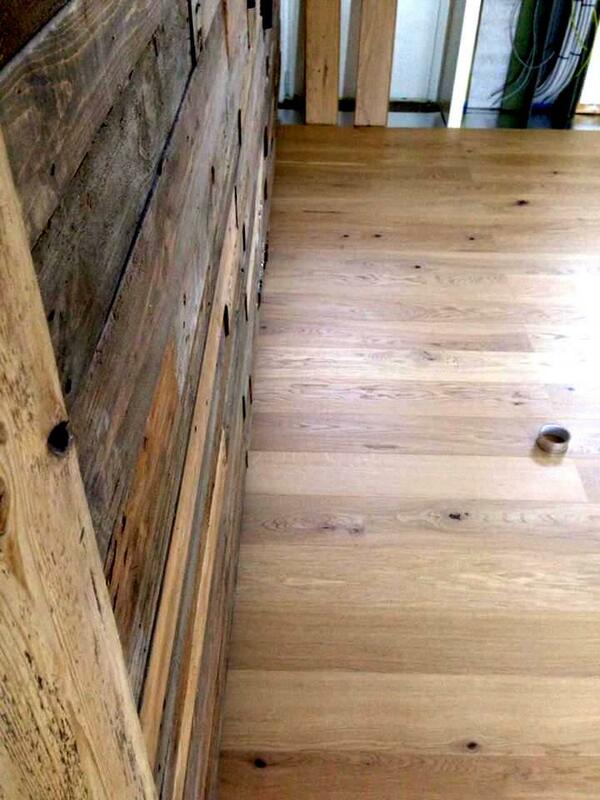 After applying stain coats or wood oil coats do let them well dried! Here wood oil has been used! Use the old paint brushes, foam pieces or simple an old cloth for staining of pallet planks, the stain coats or oil coats would also provide more strength to wood along with a bewitching allure! 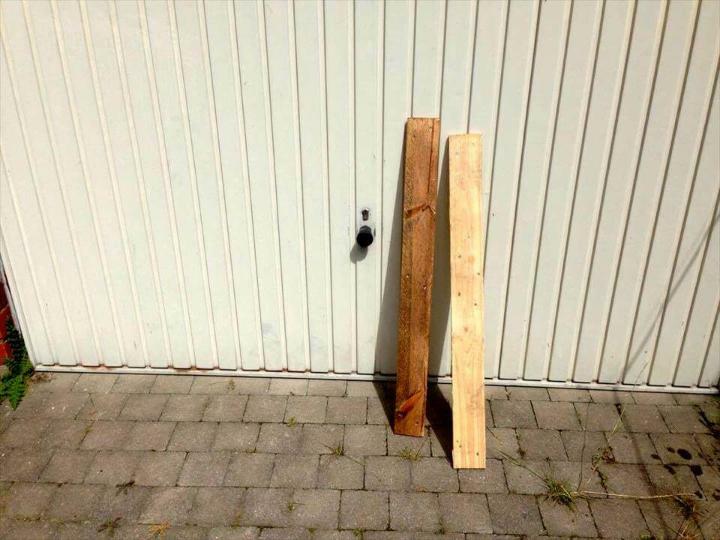 Leave some of planks blank in their natural wood tone however, some clear coats can be applied to avoid the wood from getting weathered early and also from getting damaged by water effects! 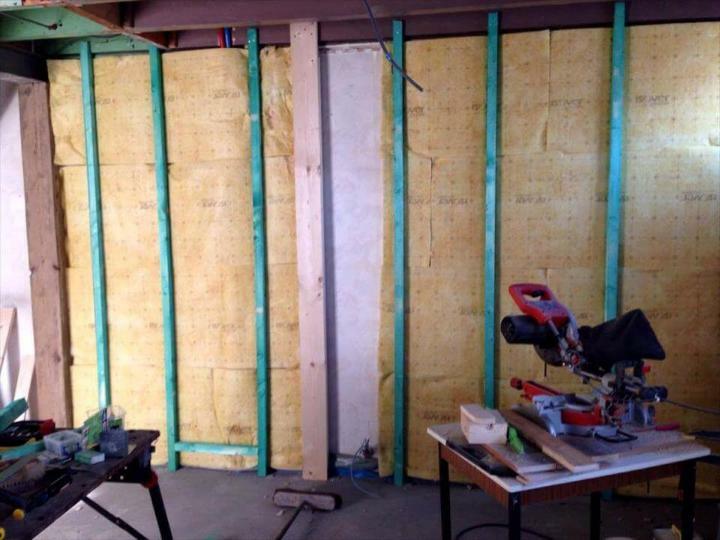 Now do the primary preparations for better wall paneling, install a rough skeleton first and do cover the wall with old fabric sheets for better results! 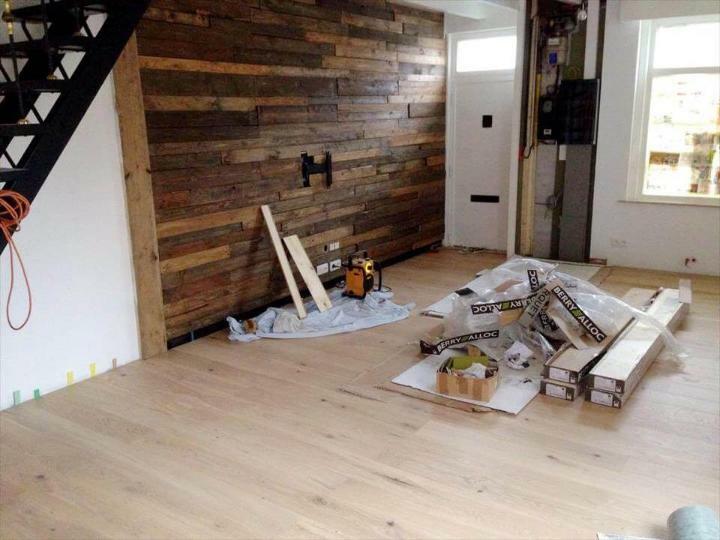 Add end wooden borders on both sides of the targeted wall area and mount the vertical wooden supports that will divide the in-between areas in equal parts so it would be easier now nail the pallet planks we fill add to fill up the entire wall area! 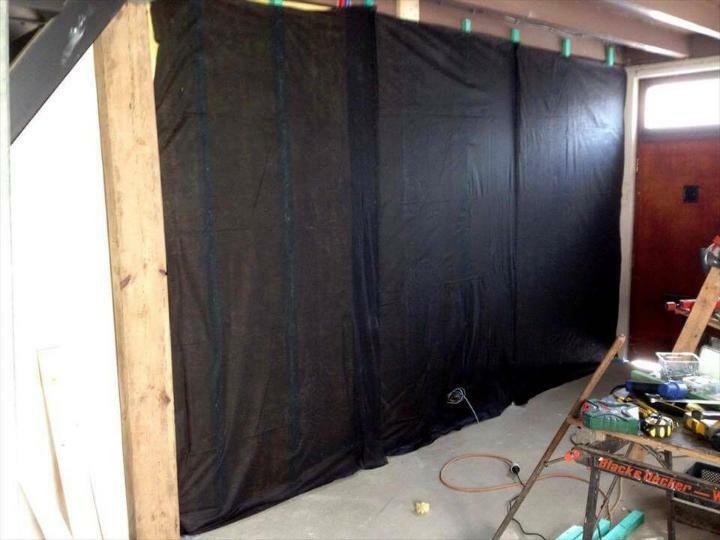 The white painted original cemented wall can be visible through the spacing among the pallet slats which can simply mar the look of entire wooden wall, to solve this issue a black fabric underlay cover has been installed that cover the entire selected wall area except the wooden pillars! 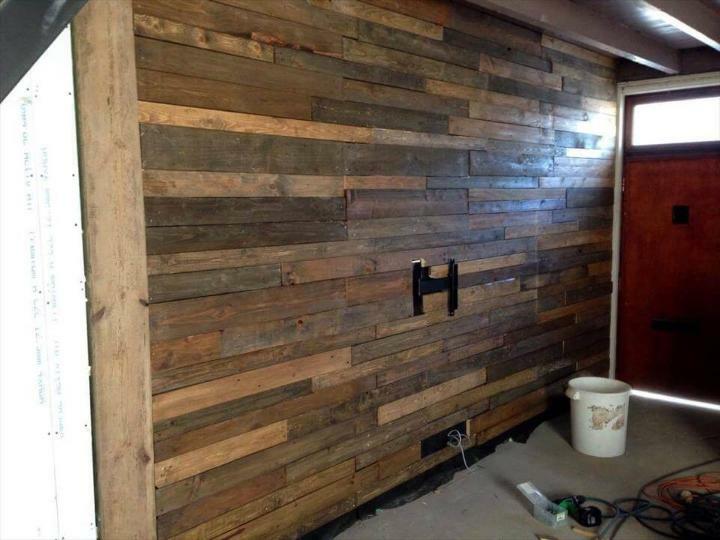 Now you can start adding those reconditioned pallet slats one by one in a flat manner to cover the wall area for a mind-blowing antique wood wall texture! 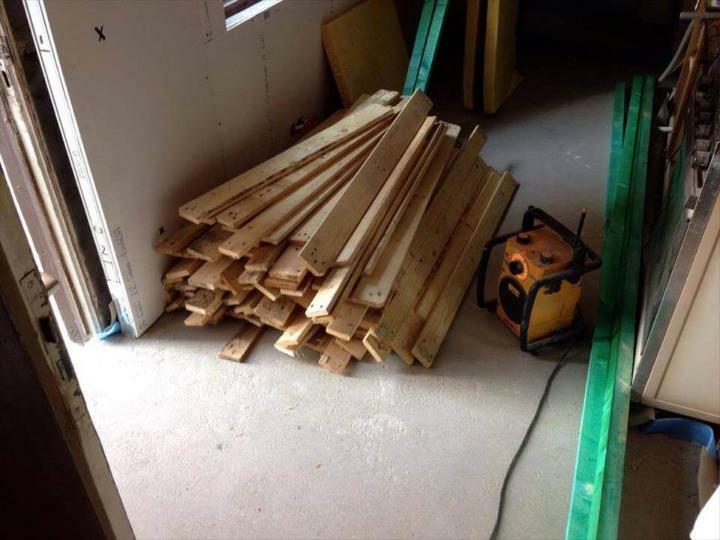 Add one plank and just secure it there by adding nails, repeat this process for every new addition! Some already made electrical outlets can be in your way, just cut the wooden out from there to reveal them over the wooden texture again to keep using them again in normal routines! Use the plastic pipe cut pieces to make those electrical outlets more graceful! Here the area selected for TV screen holding has also been cut out to fit the hardware screen holding stand in. It has been done by cutting the wooden out in H-shape! Here wooden slats have been coated with wooden oil so appear in a darker wood tone and this also helps to hide the imperfection if any! Do make the gaps for TV cables neat to avoid any inconvenience later in future! 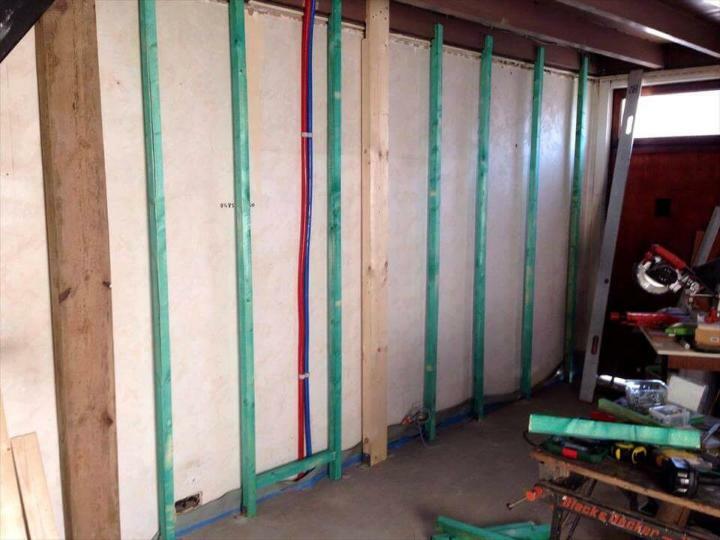 Just pull the electrical cables out softly and neatly and avoid any twist in the cable, now use additional market bought electrical outlet boards or frames to build them again over the antique textured wooden wall! 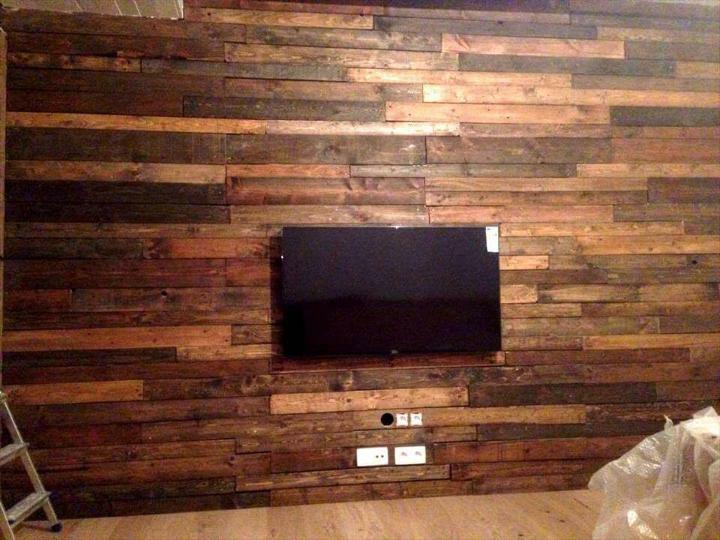 Now just install the TV scree to wall by installing the hardware screen holding system first, now the accent wooden pallet media wall is ready to serve to all media and fun lovers! This wooden pallet wall will not less than a theater in your living room if you just make it hold a big LCD TV screen, the overlay wood medium will also make it easy to install further shelves or hanging hooks so you can play more with this wooden wall creatively! 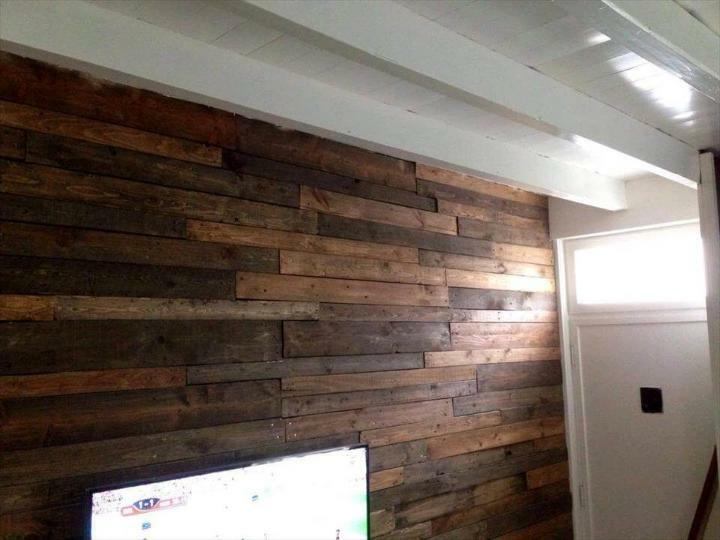 You can just repeat the same pallet wall paneling project if need to bring an instant rustic vibe to any modern living room or you are willing to add a damn rustic wooden background wall to your bedroom! Put a mini table under the TV screen to hold the respective media items and concerns there and you can also do the amazing pallet kitchen wall cladding, shop renovation and fancy wall living room wall remodeling! 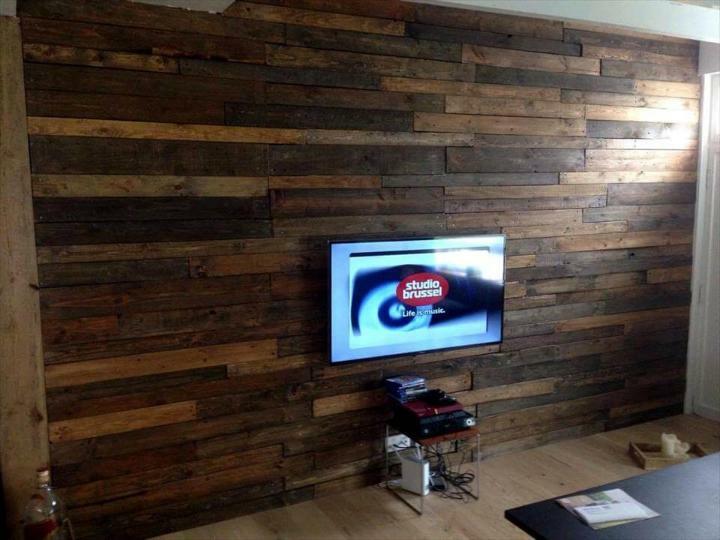 A fab rustic wooden accent wall, would also help to insulate that particular room interior as there will be no heat transfer there due to zero conductivity of wood! Also do the amazing wooden flooring and decking project with pallets, checkout brilliant suggestion about them too on our site!